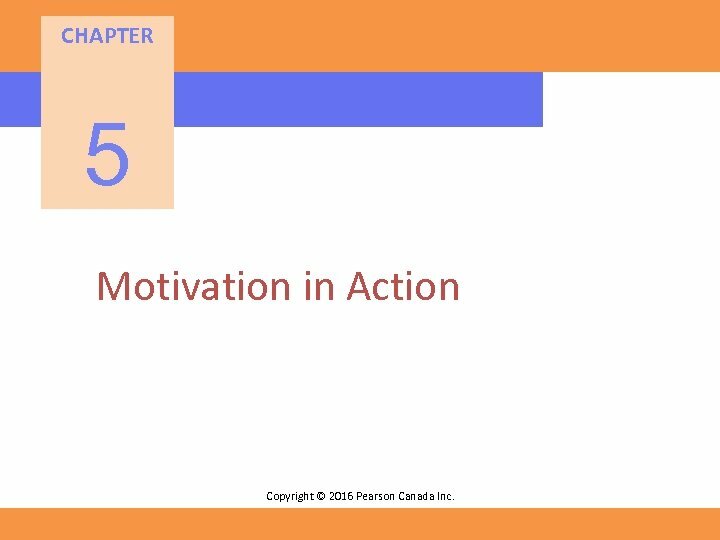 CHAPTER 5 Motivation in Action Copyright © 2016 Pearson Canada Inc.
From Theory to Practice: The Role of Money • Money is the most commonly used reward in organizations. – Money certainly helps needs get met. 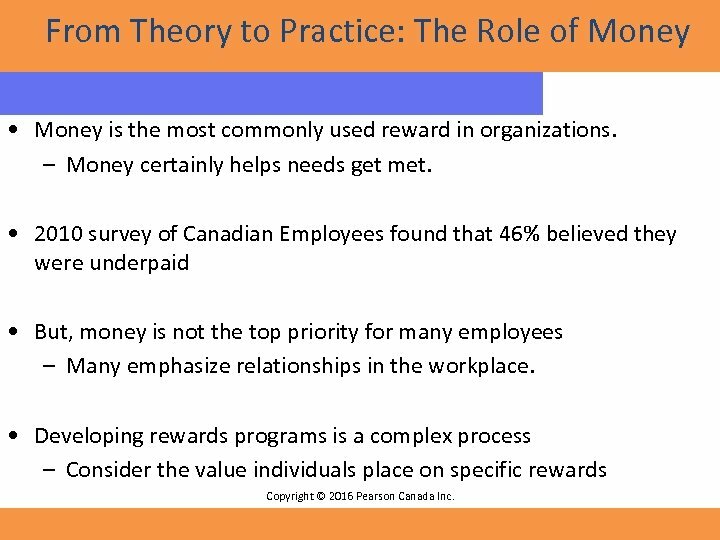 • 2010 survey of Canadian Employees found that 46% believed they were underpaid • But, money is not the top priority for many employees – Many emphasize relationships in the workplace. 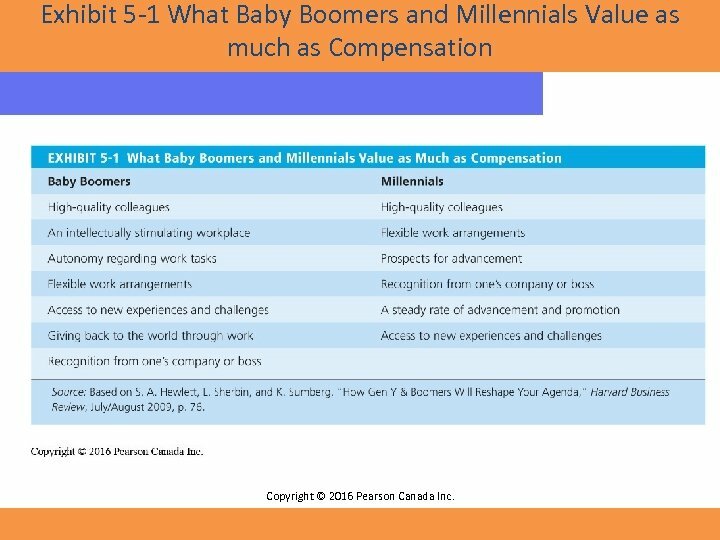 • Developing rewards programs is a complex process – Consider the value individuals place on specific rewards Copyright © 2016 Pearson Canada Inc.
Exhibit 5 -1 What Baby Boomers and Millennials Value as much as Compensation Copyright © 2016 Pearson Canada Inc. 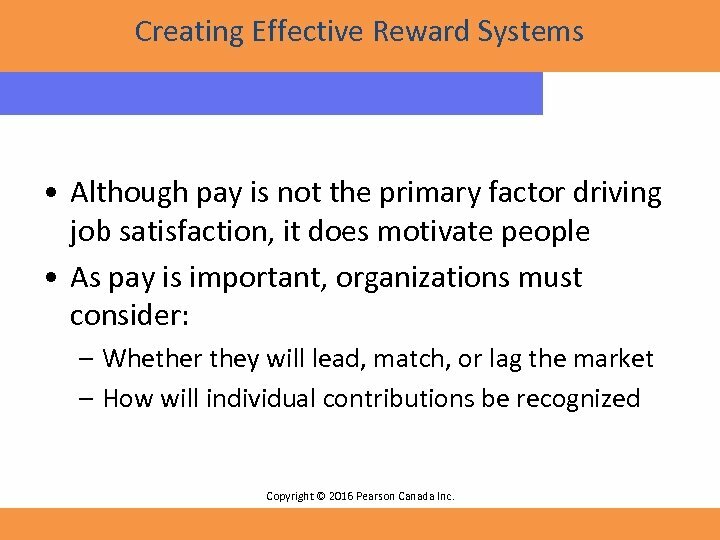 Creating Effective Reward Systems • Although pay is not the primary factor driving job satisfaction, it does motivate people • As pay is important, organizations must consider: – Whether they will lead, match, or lag the market – How will individual contributions be recognized Copyright © 2016 Pearson Canada Inc.
What to Pay: Establishing a Pay Structure • Setting pay levels requires a balance between external and internal equity – Internal Equity- the worth of the job to the organization (job evaluation) – External Equity- the competitiveness of an organization’s pay relative to industry standards • Setting pay levels (above, at, or below market rates) is a key strategic decision with important tradeoffs Copyright © 2016 Pearson Canada Inc.
How to Pay: Rewarding Individuals Through Variable Pay Programs • Many firms are moving towards Variable-Pay Programs – A portion of an employee’s pay is based on some individual and/or organizational measure of performance. 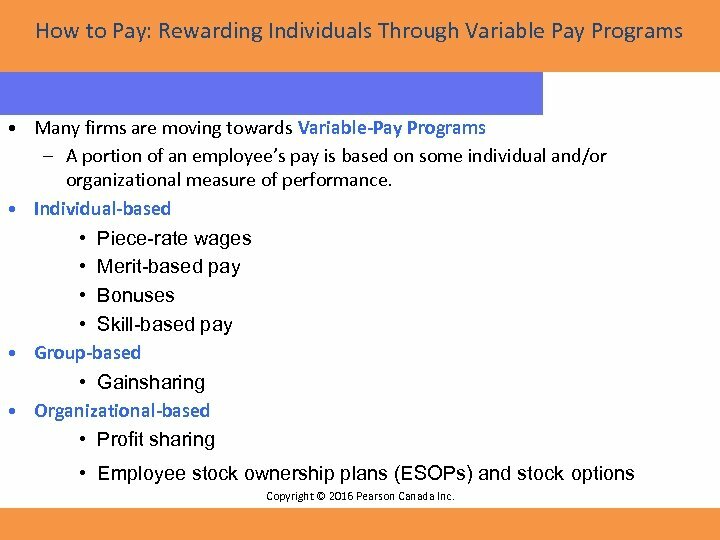 • Individual-based • Piece-rate wages • Merit-based pay • Bonuses • Skill-based pay • Group-based • Gainsharing • Organizational-based • Profit sharing • Employee stock ownership plans (ESOPs) and stock options Copyright © 2016 Pearson Canada Inc.
Variable-Pay Programs Individual-Based Incentives Group-Based Incentives • Piece-rate pay plans – Pay a fixed sum for each unit • Gainsharing of production completed. – Focus on productivity gains • Merit Based – Improvements in group – Pay is based on performance productivity determine the appraisal ratings rewards to be shared. • Bonuses – One-time rewards for defined work rather than ongoing entitlements. 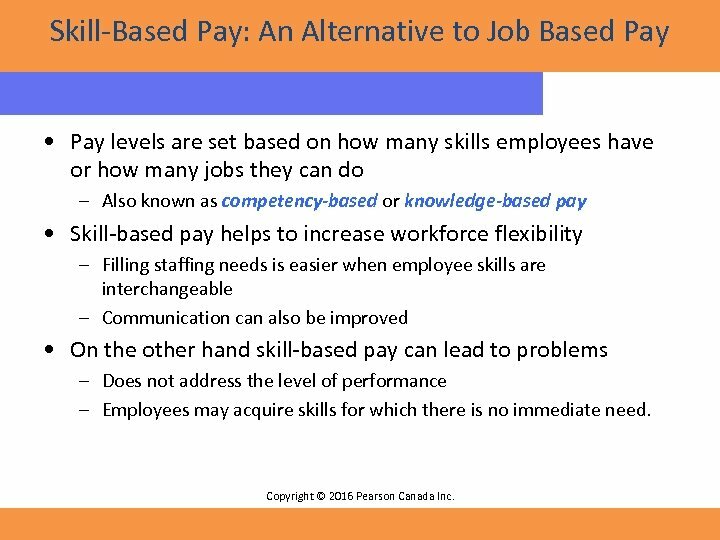 • Skill-based pay – Pay based on how many skills employees have or how many jobs they can do (see next Copyright © 2016 Pearson Canada Inc. slide). Skill-Based Pay: An Alternative to Job Based Pay • Pay levels are set based on how many skills employees have or how many jobs they can do – Also known as competency-based or knowledge-based pay • Skill-based pay helps to increase workforce flexibility – Filling staffing needs is easier when employee skills are interchangeable – Communication can also be improved • On the other hand skill-based pay can lead to problems – Does not address the level of performance – Employees may acquire skills for which there is no immediate need. Copyright © 2016 Pearson Canada Inc. 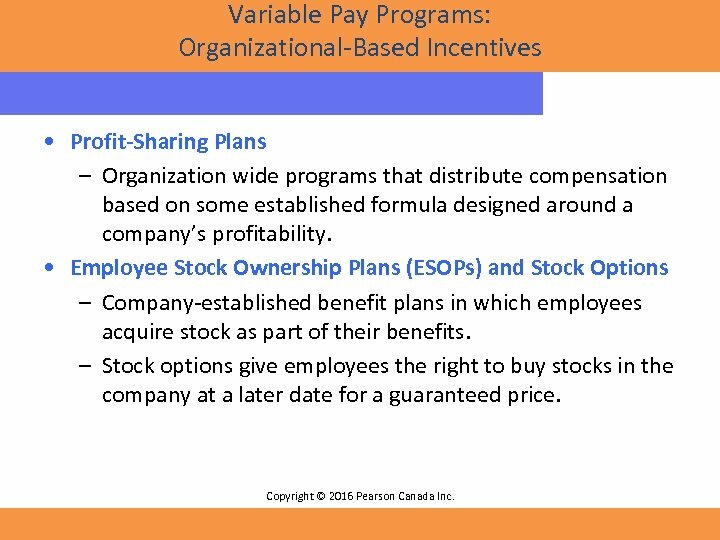 Variable Pay Programs: Organizational-Based Incentives • Profit-Sharing Plans – Organization wide programs that distribute compensation based on some established formula designed around a company’s profitability. • Employee Stock Ownership Plans (ESOPs) and Stock Options – Company-established benefit plans in which employees acquire stock as part of their benefits. – Stock options give employees the right to buy stocks in the company at a later date for a guaranteed price. Copyright © 2016 Pearson Canada Inc. 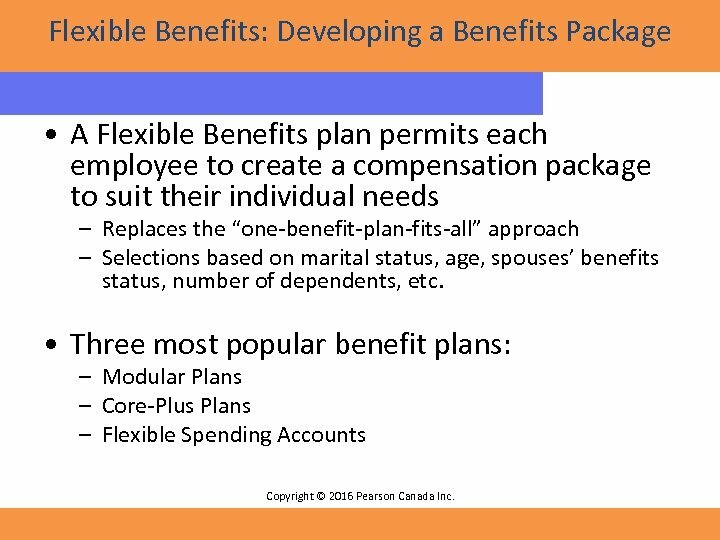 Flexible Benefits: Developing a Benefits Package • A Flexible Benefits plan permits each employee to create a compensation package to suit their individual needs – Replaces the “one-benefit-plan-fits-all” approach – Selections based on marital status, age, spouses’ benefits status, number of dependents, etc. 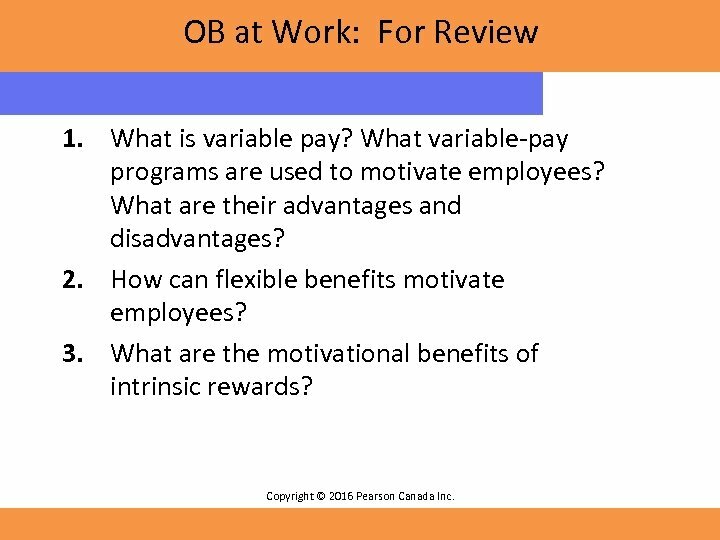 • Three most popular benefit plans: – Modular Plans – Core-Plus Plans – Flexible Spending Accounts Copyright © 2016 Pearson Canada Inc.
Intrinsic Rewards: Employee Recognition Programs • Employee recognition programs – from private “thank you” to high profile recognition • According to Expectancy Theory, the key component of motivation is the link between: – Performance and Reward • Using Reinforcement Theory, providing recognition immediately following positive behaviour leads to repetition. 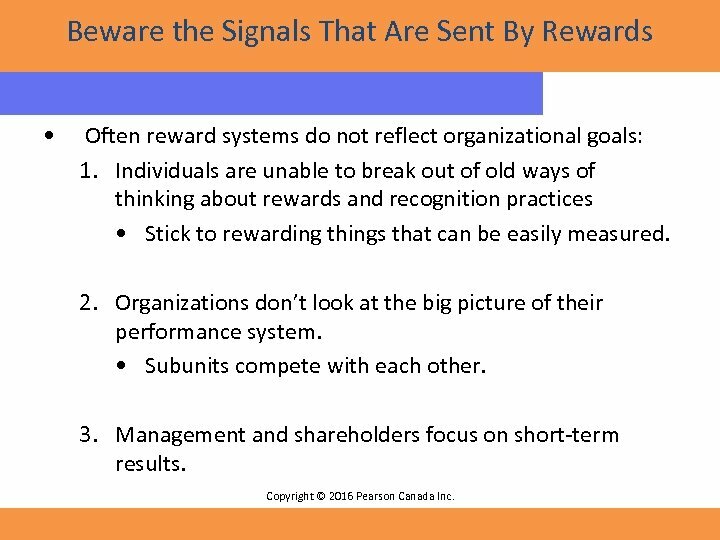 Copyright © 2016 Pearson Canada Inc.
Beware the Signals That Are Sent By Rewards • Often reward systems do not reflect organizational goals: 1. 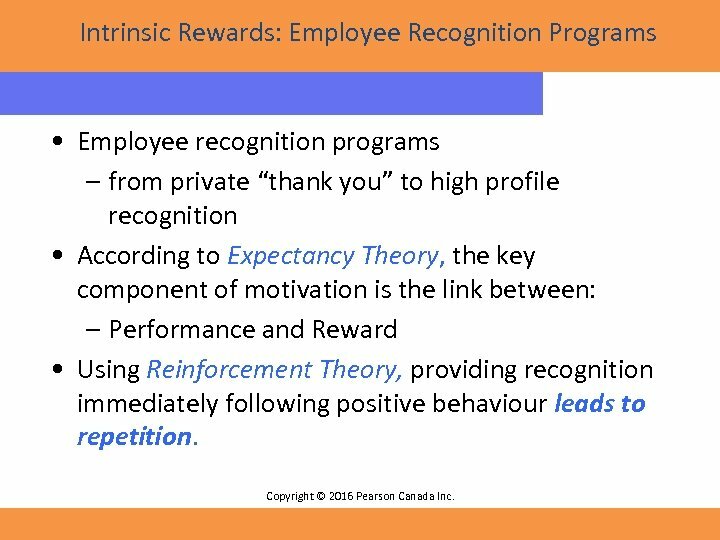 Individuals are unable to break out of old ways of thinking about rewards and recognition practices • Stick to rewarding things that can be easily measured. 2. Organizations don’t look at the big picture of their performance system. • Subunits compete with each other. 3. Management and shareholders focus on short-term results. 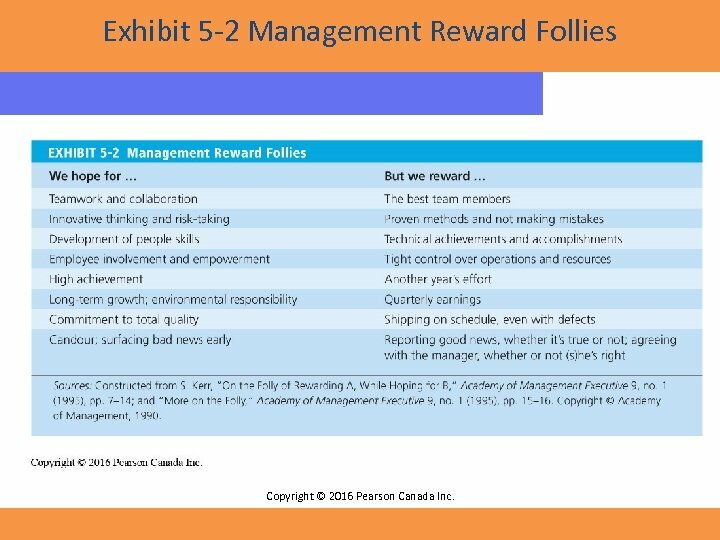 Copyright © 2016 Pearson Canada Inc.
Exhibit 5 -2 Management Reward Follies Copyright © 2016 Pearson Canada Inc. 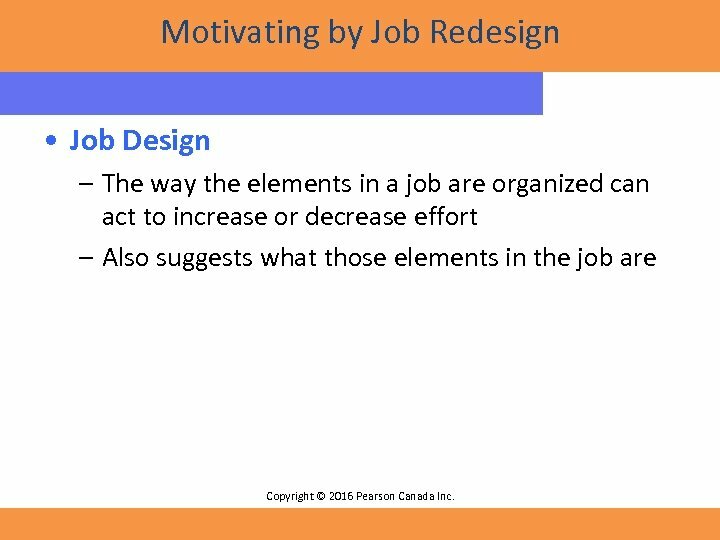 Motivating by Job Redesign • Job Design – The way the elements in a job are organized can act to increase or decrease effort – Also suggests what those elements in the job are Copyright © 2016 Pearson Canada Inc.
How Can Jobs Be Redesigned? 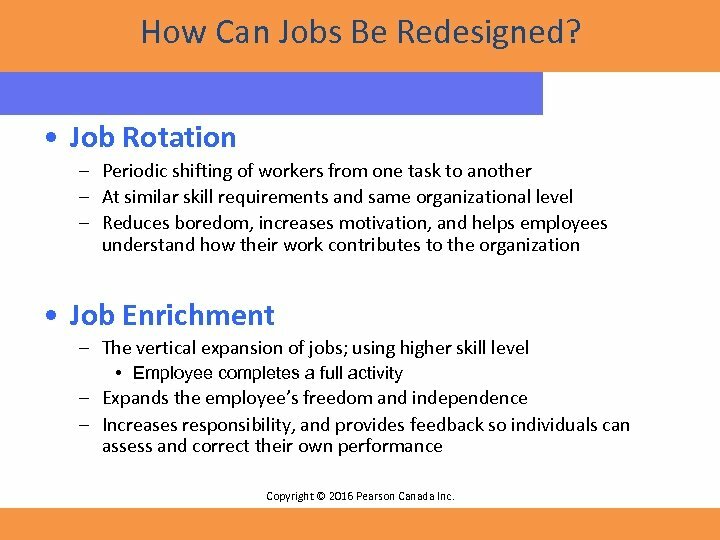 • Job Rotation – Periodic shifting of workers from one task to another – At similar skill requirements and same organizational level – Reduces boredom, increases motivation, and helps employees understand how their work contributes to the organization • Job Enrichment – The vertical expansion of jobs; using higher skill level • Employee completes a full activity – Expands the employee’s freedom and independence – Increases responsibility, and provides feedback so individuals can assess and correct their own performance Copyright © 2016 Pearson Canada Inc. 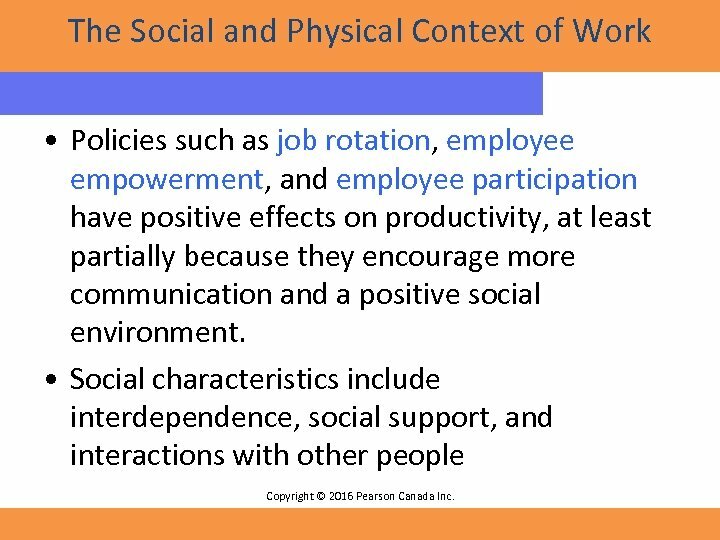 The Social and Physical Context of Work • Policies such as job rotation, employee empowerment, and employee participation have positive effects on productivity, at least partially because they encourage more communication and a positive social environment. • Social characteristics include interdependence, social support, and interactions with other people Copyright © 2016 Pearson Canada Inc. 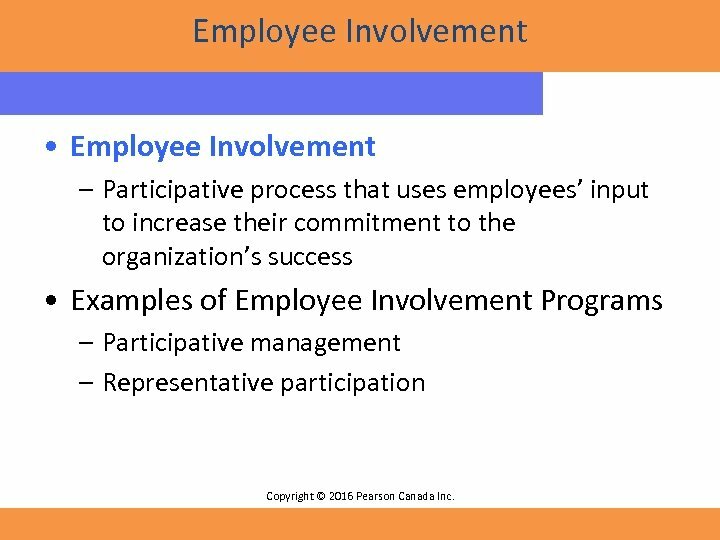 Employee Involvement • Employee Involvement – Participative process that uses employees’ input to increase their commitment to the organization’s success • Examples of Employee Involvement Programs – Participative management – Representative participation Copyright © 2016 Pearson Canada Inc. Motivation: Putting it All Together 1. What motivates people? 2. 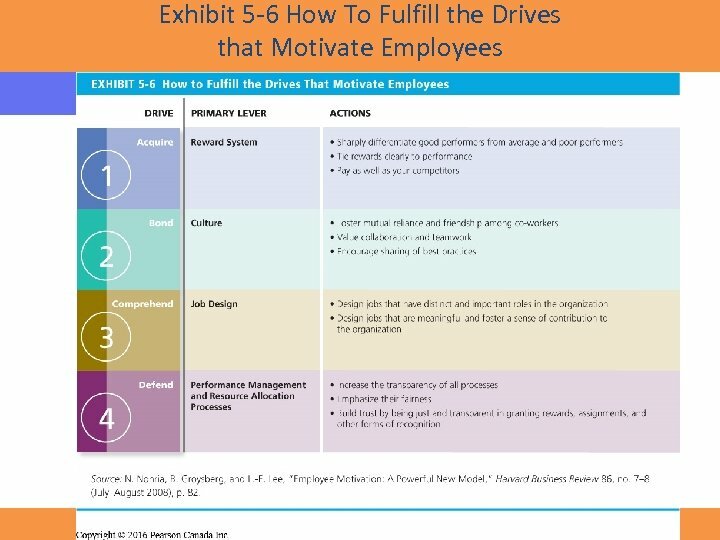 How can we use this information to make sure that the organizational processes motivate our employees? 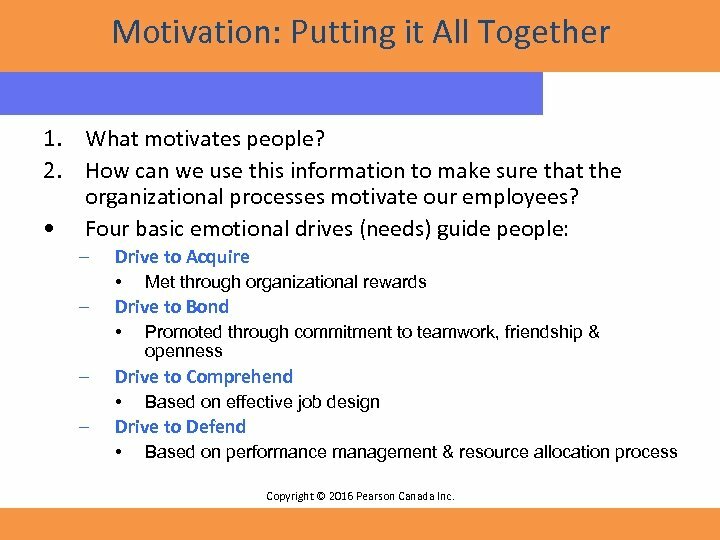 • Four basic emotional drives (needs) guide people: – Drive to Acquire • – Drive to Bond • – Promoted through commitment to teamwork, friendship & openness Drive to Comprehend • – Met through organizational rewards Based on effective job design Drive to Defend • Based on performance management & resource allocation process Copyright © 2016 Pearson Canada Inc.
Exhibit 5 -6 How To Fulfill the Drives that Motivate Employees Copyright © 2016 Pearson Canada Inc.
Summary 1. Money is not a motivator for all individuals. 2. 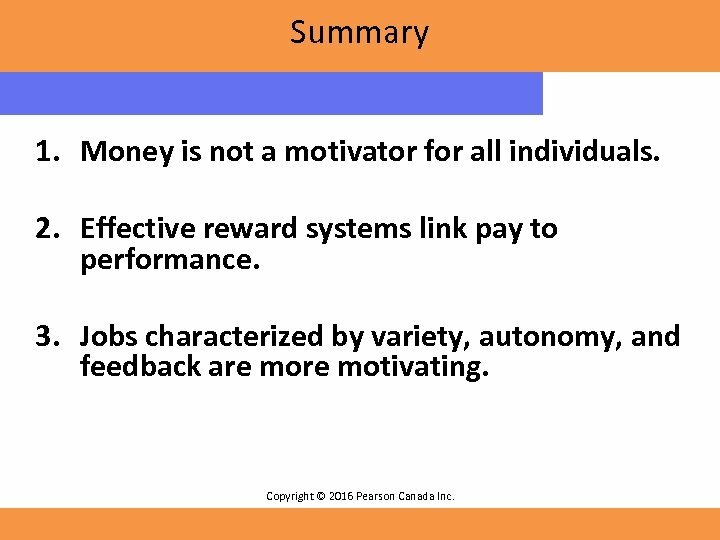 Effective reward systems link pay to performance. 3. Jobs characterized by variety, autonomy, and feedback are motivating. Copyright © 2016 Pearson Canada Inc.
OB at Work: For Review 1. 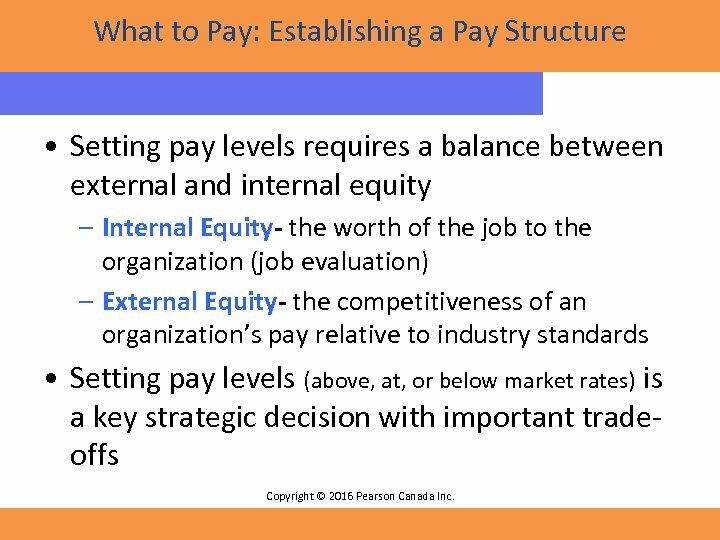 What is variable pay? 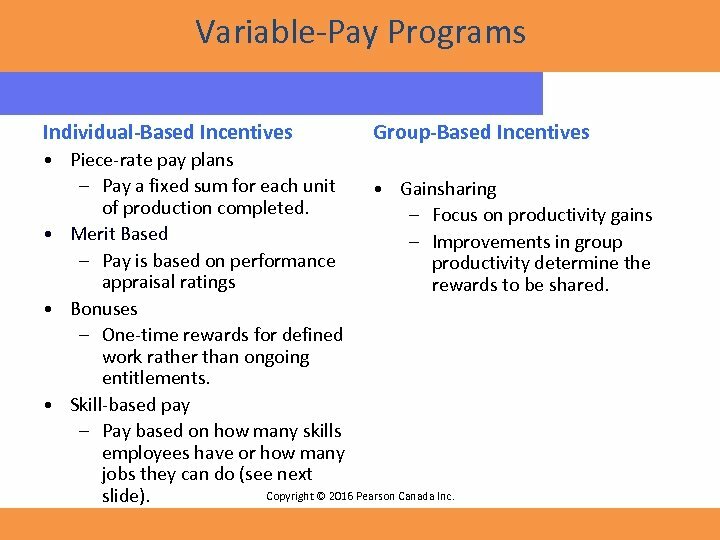 What variable-pay programs are used to motivate employees? What are their advantages and disadvantages? 2. How can flexible benefits motivate employees? 3. What are the motivational benefits of intrinsic rewards? Copyright © 2016 Pearson Canada Inc.
OB at Work: For Review 4. 5. 6. 7. What are the main ways that jobs can be redesigned? In your view, in what situations would one of the methods be favoured over the others? 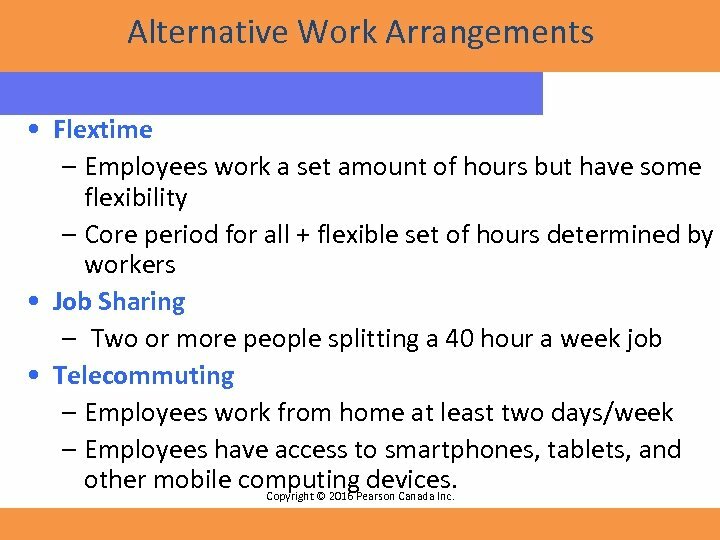 What are three alternative work arrangements of flextime, job sharing, and telecommuting? What are the advantages and disadvantages of each? What are employee involvement programs? How might they increase employee motivation? How can motivation theories be used to create more motivating work environments? 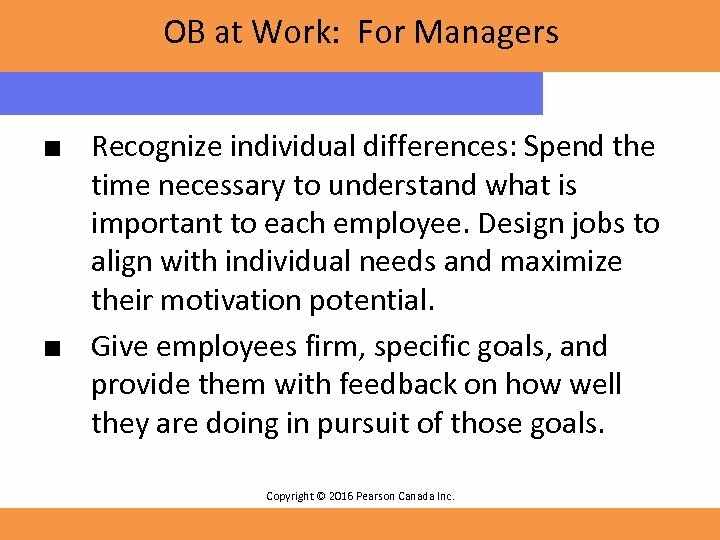 Copyright © 2016 Pearson Canada Inc.
OB at Work: For Managers ■ Recognize individual differences: Spend the time necessary to understand what is important to each employee. Design jobs to align with individual needs and maximize their motivation potential. ■ Give employees firm, specific goals, and provide them with feedback on how well they are doing in pursuit of those goals. 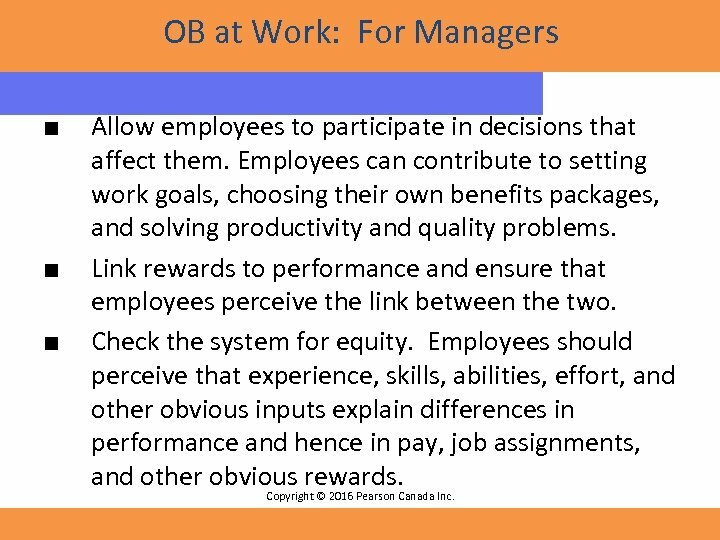 Copyright © 2016 Pearson Canada Inc.
OB at Work: For Managers ■ ■ ■ Allow employees to participate in decisions that affect them. Employees can contribute to setting work goals, choosing their own benefits packages, and solving productivity and quality problems. Link rewards to performance and ensure that employees perceive the link between the two. Check the system for equity. Employees should perceive that experience, skills, abilities, effort, and other obvious inputs explain differences in performance and hence in pay, job assignments, and other obvious rewards. Copyright © 2016 Pearson Canada Inc.